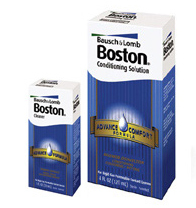 Contact lens solutions need to effectively perform two functions. One is cleaning. The product must remove the naturally occurring organic substances that are deposited on the lens from the tear film and environmental contaminants that collect on the lens surface as it is worn. The system must also disinfect the lens. Simply, it must kill any bacteria that are on the contact lens from being handled and worn. When a lens is put on the eye, the natural ingredients of the tear film start to coat it. Making the lens more like the surrounding structures is part of the adaptive process. With time this biofilm starts to layer on the lens. In the average eye, after two weeks of wear that coating is so thick that the disinfecting component in the care solution cannot penetrate all the way to kill bacteria that are on the surface of the contact. Rubbing the lens with the cleaning solution creates friction that removes the biofilm, exposing the underlying bacteria, which allows the disinfecting component to work effectively. 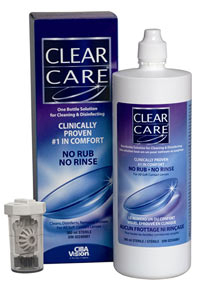 Two week lens wearers typically use a multi-purpose solution: one product that cleans and disinfects. Longer replacement cycles require more aggressive hydrogen peroxide based agents and sometimes specialized cleaners and protein removers. Your Parrelli Optical® contact lens professional will make recommendations specific to your lenses, your wear schedule, and your eyes.